Costco Holiday Book Deals & Sales 2016. 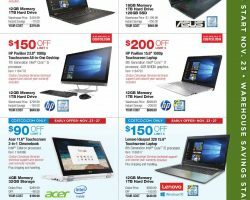 Save with Costco on Laptops, Tablets, Printers, Jewelry, Patio Furniture, Fitness equipment, bedding, dining sets, holiday gifts, appliances, office chairs, while supplies last. Shop brands like: Kirkland, Portofino, Casio, Dell, Lenovo, HP. Get discounts, coupon offers and Free Shipping when shopping online. View Costco Black Friday 2018 Ad & Costco Black Friday Deals. Find this year Costco Sales & Best Deals for laptops, tablets, HDTVs, cameras, furniture.